If you don’t have a sausage stuffer it may feel like you can’t make sausage, but that’s just not so. I enjoy sausage patties for breakfast so I don’t need my sausage to be in a casing. 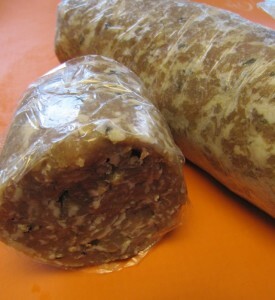 My solution is to prepare my sausage and then roll it in plastic wrap: the thickness is up to you. Once rolled I tighten the ends and leave it in the fridge to set. When I want some sausage patties for breakfast I slice off a few discs, remove the plastic wrap from the outside of each patty and fry them up. It’s simple, clean and easy. It really depends on what sausage recipe you use. For a fresh sausage it will last about 3-5 days.